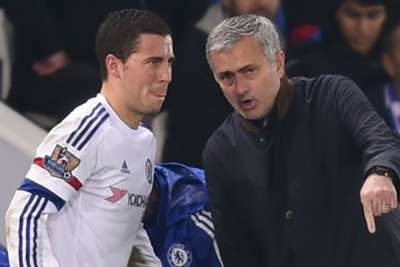 Jose Mourinho has lauded Chelsea's Eden Hazard as the Premier League's best player, adding that he wishes there was a possibility of the forward joining Manchester United. Currently the league's leading scorer with seven goals this term, Hazard has recaptured his best form under Maurizio Sarri, although he told Belgian outlet HLN during the international break that he wishes to work under Mourinho again. And, ahead of Saturday's clash with Chelsea at Stamford Bridge, United's manager has echoed those sentiments, insisting that Hazard is the difference when it comes to winning the title. "I would love to have him at Manchester United," said Mourinho, whose side trail joint-leaders Chelsea by seven points. "But I don’t think Chelsea will sell him to Man United so it's not a problem because Chelsea is led by intelligent and experienced people in football. "History says that when Eden Hazard is the best player of the Premier League, Chelsea is the champion. It happened with me and Antonio [Conte]. "And this season, it is still the beginning of course, but if he is the best player of the Premier League until now, which I think he is until now, Chelsea is top of the league because he is the kind of player who can make a huge difference."